There’s lots to look forward to in this week’s Fortnite update. The biggest addition is the new Reboot Van, which lets you bring fallen teammates back into the game. A popular limited-game mode also returns this week, while the new Buccaneer’s Bounty event lets you test your skills in a fresh LTM every day. But it’s not all good news. 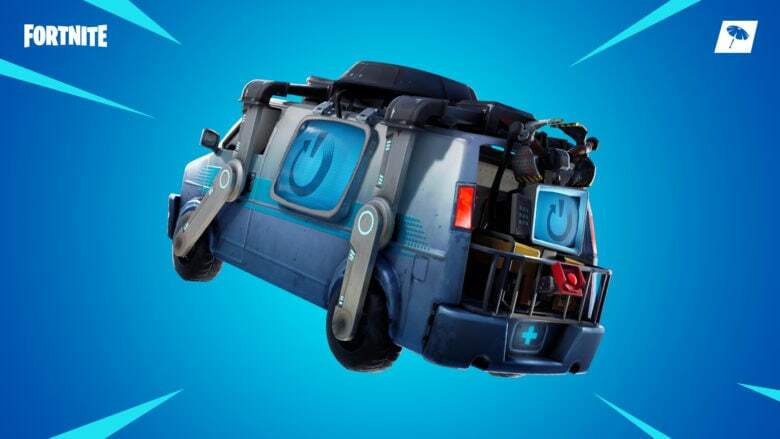 The new Reboot Van was obviously inspired by Fortnite’s latest rival — Apex Legends. It uses the same concept: Players drop a Reboot Card when they’re eliminated, and a teammate can pick it up, take it to a Reboot Van, and bring them back. Reboot Vans can be found in all major points of interest during duo and squad games. You obviously won’t find them in solo matches, and Epic has decided not to include them in big team LTMs, either. There are some things you’ll need to be aware of when it comes to reboots. Firstly, Reboot Cards will only be available for pickup for 90 seconds after they’ve been dropped. More than one can be used to revive multiple squad members at the same van. Any member of the squad can revive a fallen teammate after their card has been collected; it doesn’t have to be the player who picked up the card. It takes 10 seconds for players to return to the game, and then the van cannot be used again for 120 seconds. This week’s limited-time game mode is Fly Explosives. Only explosive weapons can be found in this mode, and the rocket ammunition cap is increased to 120. This is the only game mode in which you’ll be able to find jetpacks. There’s also a new Buccaneer’s Bounty event this week, which lets you play a different LTM every day. Complete the free challenges in each one to earn the in-game rewards between April 10-15. Fortnite’s 8.30 update also brings a long list of bug fixes, improvements, and tweaks. You can read through them all by checking out the full patch notes on the Fortnite blog. Sadly, one thing you won’t see is the return of health, shield, and material rewards for eliminations. Epic removed this last week, but despite the disappointment of almost every player, it is yet to bring it back. Here’s to hoping it will soon change its mind.